The second great set piece of both the Darusman Panel Report and Gordon Weiss’s book is the alleged attact on Puthukkudiyirippu Hospital. The Report begins by claiming in Para 90 that ‘PTK hospital was the only permanent hospital left in the Vanni, and its neutrality was recognized by the Government and the LTTE… More than 100 new patients were arriving each day, many from the NFZ. Many had severe or life-threatening injuries caused by artillery fire or burns.40 The casualties, many of them babies, young children and the elderly, were packed in every conceivable space – on beds, under tables, in hallways and outside in the driveway’. It is claimed that many photographs of this were relayed both to UN Headquarters and to the Government. The Report, in claiming that ‘between 29 January and 4 February, PTK hospital was hit every day by MBRLs and other artillery, taking at least nine direct hits’, declares baldly in a footnote that ‘Previously, PTK hospital had been shelled on 12 Jan. 2009’. This is a much larger claim than that made by Tamilnet on the 13th of January that one person was killed when the ‘hospital premises and its environs came under artillery fire’. Two days earlier it had been claimed that ‘Artillery shells exploded near Puthukkudiyirippu hospital’. This gives a very different picture, of possible collateral damage, in contrast to the efforts of the Panel to substantiate its dogmatic assertion that ‘The Government systematically shelled hospitals on the frontlines’. TamilNet - Ponnampalam hospital in Puthukkudiyiruppu, capable of serving more than 100 patients a day, admits 15 to 20 patients a day, and conducts about 30 major, 70 minor operations a month, under normal circumstances. The simplistic footnoting however is only an adjunct to the main claim. About this there is some confusion, because there were in fact two hospitals in PTK, one the hospital the neutrality of which was understood by both sides, as the Panel reports (even though Weiss notes that heavy Tiger artillery was stationed ‘just 300 metres from the hospital’), the other the Ponnambalam hospital which Weiss notes ‘was primarily intended for wounded Tiger fighters, but it treated large numbers of civilians as well’. The existence of this hospital was not initially acknowledged, understandably enough, for it had been built for military purposes with money brought in ostensibly for humanitarian support for civilians. 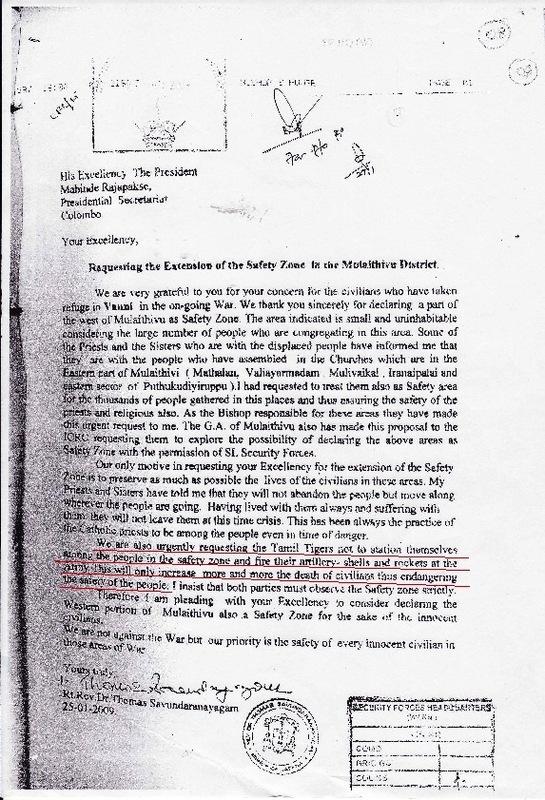 Weiss asserts that both hospitals ‘would be repeatedly bombarded or attacked by air, contrary to the laws of war’, but in fact Tamilnet does not seem to mention the existence of this hospital or any attacks until February 8th, when it mentions that the Air Force ‘bombed Puthukkudiyirippy (PTK) Ponnampalam hospital killing 61 patients’ on Friday 6th February. Another report of the 7th, in my record of allegations against the Air Force, claimes that the Air Force ‘bombed and fully destroyed Ponnampalam Memorial hospital in Puthukkudiyirippu (PTK). 61 patients were killed in the attack’. 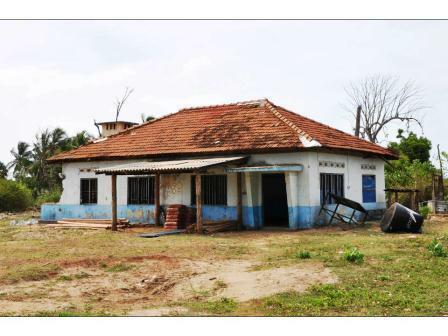 The Panel report, it should be noted, says only that ‘Ponnambalam Hospital, a private hospital used in part by the LTTE, was shelled on 6 February 2009, causing part of it to collapse’. Fraudulent claims were made throughout. A very reasonable report of the American government noted allegations of shelling of the hospital before January 29th but added that satellite pictures it had from that day showed that the hospital was still functioning. The allegations in my records deal primarily with what is called the Udaiyaarkadu hospital, beginning with the assertion on January 24th that ‘Shells exploded inside the hospital premises of Udaiyaarkaddu. At least 60 shells exploded behind the hospital premises’. On the 26th ‘a remaining doctor fled’ (though it is not clear from where), while ‘reports from the medical sources in Udaiyaarkaddu’ claimed that all civilians remained under bunkers for more than 5 hours while ‘The makeshift hospital at Udaiyaarkaddu was on total disarray as 10 patients were killed and four ambulances damaged. The doctors have called for the ICRC, which is also helpless under the bunkers, the reports said’. On 27th January further reports from the hospital were only that ‘the area surrounding hospital has been targeted by SLA fired artillery shells’. And on the 31st Tamilnet reported that ‘Eight wounded civilians have been rushed to Udaiyaarkaddu hospital and a mother has succumbed to injuries’. The headline to that report, making clear the then requirement of the LTTE, was ‘SLA shelling continues on “safety zone”, Colombo refuses international call for ceasefire’. This is hardly evidence of systematic shelling of hospitals on the frontline. Then, on February 2nd, we are told that the army ‘fired artillery shells on both the hospitals in Vanni again’, reminiscent of the Weiss assertion that both hospitals would be repeatedly attacked. Weiss meanwhile makes it clear that the Udaiyaarkaddu hospital was not one of the PTK hospitals, in that he says that ‘An artillery attack had struck a small ICRC clinic in the village of Udayarkaddu’. It is remarkable then that, until February 2nd, Tamilnet makes no mention of attacks on either of the PTK hospitals. 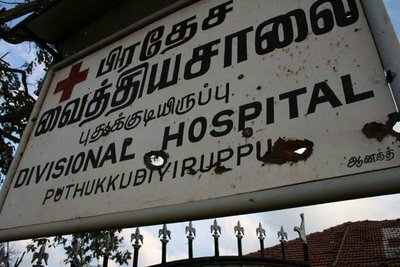 The February 2nd report I cited claims that a nurse ‘attending a wounded patient at Udaiyaarkaddu makeshift hospital (Ki’linochchi hospital) was killed when 3 shells hit the hospital.’ It goes on to say ’10 civilians, including ICRC/SLRC staff stationed in the vicinity of Puthukkudiyirippu (PTK), were wounded’, but further adds that ‘Hospital authorities were unreachable to verify the details’. Weiss associates the ICRC communiqué issued at this time with the attack he mentions of the clinic in Udayarkaddu, and then cites a press release I had issued and claims that I accused the ICRC of ‘either wilful ignorance or naivete’ for suggesting that army shells might have killed civilians. What he cites for this preposterous claim is an article in the New York Times by Somini Sengupta that appeared on January 29th. He seems to have been engaging in wiful distortion since my claim was with regard to the facts that the ICRC had omitted in its press statement. I drew attention to the LTTE refusing ‘passage to ambulances which were to leave the LTTE controlled area for the hospital in Vavuniya’. I drew attention to two UN agencies finally, after keeping quiet about this for months, issuing ‘categorical requests that the LTTE permit the civilians it has been detaining for so long to move into government controlled areas’. I drew attention to the ICRC in Colombo being ‘well aware that it is the LTTE that has barred the movement of civilians, despite which, braving execution by the LTTE, several thousands have now found their way to government controlled territory’. I drew attention to the ICRC knowing ‘that the UN thought that it had painfully negotiated permission to leave for members of staff and their dependents, only to find them stopped, so that two international staff too felt obliged to stay behind for the safety of these hapless civilians. On the day the ICRC in Geneva issued its demarche, the LTTE refused permission for those two international staffers, along with the ambulances, to leave LTTE controlled territory’. Letter from Bishop of Jaffna - January 2009 - urging LTTE not to fire at SLA from amongst civilians. This is a far cry from claiming that the ICRC was naive in suggesting that army shells might have killed civilians, which was not what was claimed by the ICRC statement in the manner Weiss insinuates. Even more revealingly, in yet another example of the shoddy manner in which the Darusman panel worked, it talked about an ICRC communiqué that was issued on ‘1 February 2009…. emphasizing that “[w]ounded and sick people, medical personnel and medical facilities are all protected by international humanitarian law. Under no circumstance may they be directly attacked.”’ and then went on to declare that ‘The Ministry of Human Rights and Disaster Management responded by accusing the ICRC of “either wilful ignorance or naiveté”.’, citing as its evidence for this the same article by Somini Sengupta of 29th January. Obviously they had not bothered to look at my own article, which Sengupta quoted, and which was posted on the Peace Secretariat website on January 30th. How three ostensibly learned people could decide that an article published on January 30th was a response to a statement made on February 1st would be astonishing were the nexus between Weiss and the Darusman panel not clear. They seem to have picked up his narrative as well as his apologies for argument wholesale, and then happily confused them, with no effort at all to check original sources or bother about consistency. Appalling though the comparison might be, clearly even Tamilnet is more dependable than these myth-makers. Going back to their reports at the time, we should note another of February 2nd that claims that ‘Both the hospitals at Puthukkudiyirippu (PTK) and Udaiyaarkaddu have been hit by the shelling’, though that also has the claim that ‘At least one hundred civilians could have been killed or maimed in the indiscriminate barrage’, an unusual diffidence for what was said to be ‘”the worst day of SLA shelling so far within the safety zone”’. This diffidence should be compared with the confident claim a week earlier that ‘more than 300 people have died’, which seems to confirm the view of the UN Resident Coordinator at that time that most of the shelling then came from the LTTE side. On the same day however we have the first straightforward assertion that the army ‘shelled Puthukudiyirippu (PTK) hospital Sunday night killing nine civilians.’ There is no further mention of harm to that hospital although on Thursday the 5th of February it was reported that ‘The only remaining hospital in Udaiyaarkaddu within the so-called safe zone has again come under heavy shelling by the Sri Lankan army on Thursday. At least 7 civilians were killed and 27 wounded in the close vicinity of the makeshift hospital functioning at a school’. Once again, there is no claim of casualties in the hospital, which makes it crystal clear that the allegations of deliberate attacks on hospitals are absurd. It is only on the 8th that, as mentioned, we are told the Air Force bombed the Ponnampalam hospital which – leaving aside its shady origins – was not supposed to be functioning at the time. Though Weiss talks of the ‘sheer scale of the shelling of PTK hospital’, there is no evidence of this in Tamilnet claims at the time, and we know that at the end of Janurary ‘hundreds of seriously wounded’ were evacuated to government territory. Weiss also notes that, on January 5th, ‘the ICRC evacuated. All the drugs and equipment that remained were loaded into jeeps and trucks, along with 300 of the most seriously wounded patients’. No information was conveyed that the hospital meant for LTTE cadres was still functioning, perhaps for the simple reason that that had been kept a secret throughout, given the abuse of funding that had occurred. There was a civilian hospital in PTK which was recognized as such by the government. 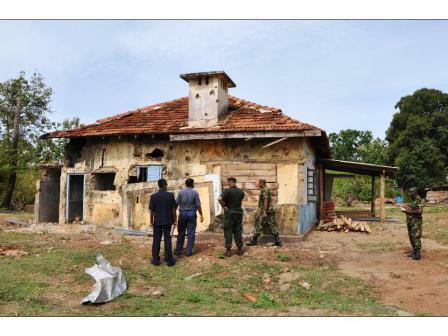 The LTTE had its own not openly acknowledged hospital for its cadres. Both hospitals were used for both civilians and cadres. The LTTE kept heavy weapons near the PTK hospital (and probably near the other as well). In short, the showpiece of Weiss as well as Darusman seems to be a construct, full of blood and thunder and emotion, signifying nothing.